When driving your vehicle, you always want to feel that you are always in control. The Chrysler Pacifica, a recently-introduced minivan that has become popular for its multitude of features, will ensure that you are. That’s because this minivan includes two key features: electronic stability control and traction control. Whenever your Pacifica begins to oversteer or understeer, electronic stability control applies individual brakes and controls your throttle as needed to help put you back on track. And traction control ensures that the grip of your tires on the road is maximized, especially when the driving surface is compromised by rain, snow, or ice. Both features live up to their naming; they make sure that you are always in control of your driving prowess. 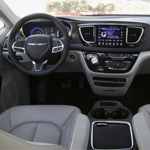 For more on the Chrysler Pacifica, definitely give us a call today and set up an appointment. You can test-drive one of our minivans and sit down with one of our Chrysler experts.